With diesel direct drive the flywheel of the diesel engine is connected to the drive flange of the Z-drive by means of a cardan or carbon linked shaft. This drive shaft is always fitted with one or more flexible elements to minimise the transmission of vibrations. 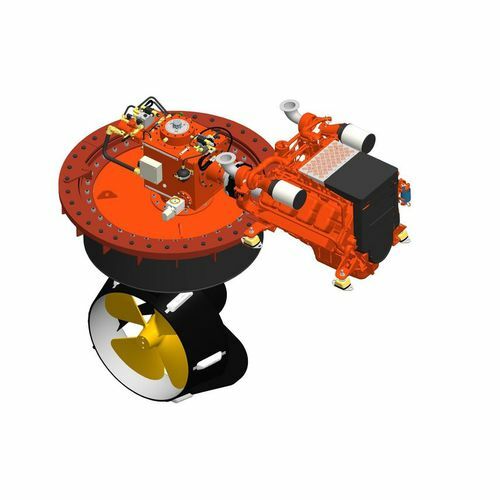 After the drive flange of the Z-drive, the drive power is transferred to the propeller through a right-angled gear box at the top and angular gear drive under water. The specially designed and treated gears of the Z-drive ensure low noise levels and optimum transmission of the diesel power. The Z-drive is fitted with an integrated hydraulic clutch to be able to set the propeller to 'free wheel'. The clutch is constructed heavily enough so that many switches, as is often found with ferries, can be handled without any difficulty.